I am trying to do maintenance on a old air compressor and I would need some help. 1. I can't figure exactly where to fill in the new oil. I see the drain plug but don't know where to fill the new one. 2. About the oil level, it look like full currently, must I full it to the top of the oil gage ? 3. They tell on the notice to grease the motor yearly but not to over lubricate. How much grease should I add ? 4. I realized that their is no air filter currently and this haven't seem to be a problem for all the time it served. Can I continue like this without air filter if I don't do paint job ? What oil gauge are you referring to. If you have a dipstick, that would be the fill point. I didn't see what you were referring to. ?? Are you seeing a drain for water sometimes like an old radiator type is just a drain. Other should be lowest and highest perhaps square plugs like a gear case but must be vented - depends on exact thing as to what to do. I'm not sure if you can see it in the onedrive images I've sent though. I'll look at this to find something for the air filter. I can't make that format show - needs to be a link like copy/paste from a site that lets you like photobucket and your first one shows but doesn't copy for me. Almost all are just dumb oil for a compressor piston far less critical, and not oil burning like an engine. You should be able to just look and know or leave it alone. If you want super clean dry air you no doubt need all new stuff. What I saw with a tank would run air tools, fill tires and so on and might have to wait for it to refill tank using a lot of air. Yes, that is a level indicator. You may have another point to fill it but I believe it's possible to fill it right from there. I see a removable cap on it. Old thing and get the idea if those show. #1 suggests a drain plug as you thought. Pic #2 may show level of oil and or showing mix with water - not sure but would or should have like a ball point pen top cap nut type thing to allow it to work I would think just on assorted old stuff not just compressors. That such that it can vent or the sight glass would be air locked - right? Pic #1 one shows a cap like a freeze plug to me. That is likely the center of a crankshaft for a piston doing the compressing and idea for oiling is splashing but only so much. Actually a lot like a basic lawn mower type engine that is "splash" lubricated not oil pumped. There should be a fill level plain plug and don't know why not or just not found. This is the pump not the tank for the compressed air and the two are not sharing oils or shouldn't be IMO. 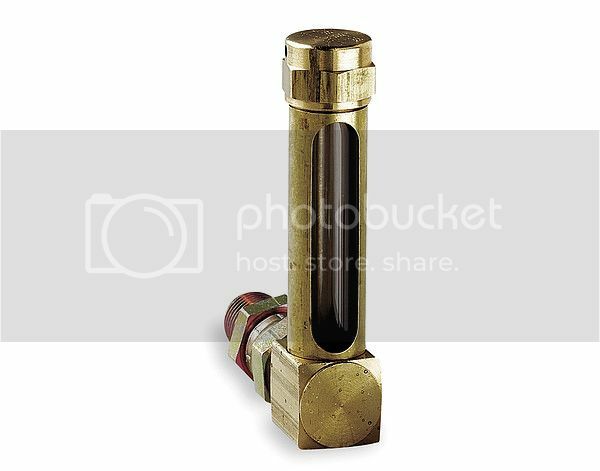 Again, compressing air can make water so air tank should have some type of drain itself on this old thing which isn't bad because of age just that new crap wouldn't have anything until you went for better stuff for the need for compressed air at all. A nail gun, tools, fill things like tires or use as a blowing tool too. Painting with compressed air not my thing. Full attention to air quality would be quite important. So is the room (special dust free rooms for that) no dust and so on. Not my trade area and not needed for other air pressure needs. Just to let you know that I've done it. Oil was needed to be filled through the "elbow" top left on the base block. The oil gage was what I was thinking. To use it properly I needed to unscrew the top screw just a bit and to lift and hold the little metal cover for the air to circulate and the level to stabilize.